Bad Quilt – Almost Done! 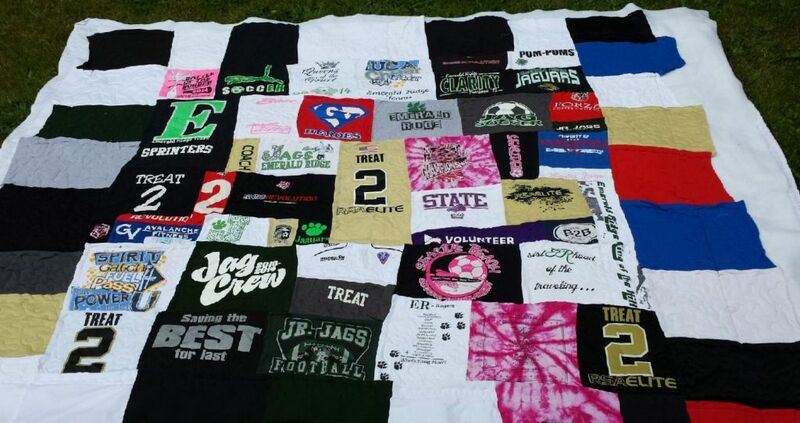 Thank you to everyone who posted a comment about this T-Shirt quilt. I was feeling pretty low about working on it yesterday, but your words of encouragement and also your own quilting horror stories made me feel that I wasn’t alone in something like this. The recipient of the quilt is a High School Senior (female) who is graduating in a few weeks. Her Mother made the quilt top for her and the quilt will be going off to college in the fall. And here it is after quilting! Not too bad, but not real good. I did the best I could. I got the quilting done a few minutes ago and laid the quilt on the grass so you could see it all. Click on any photo for a larger view. It doesn’t look too bad, but …..
Now, it’s on to the binding! At this moment I am working on the worst customer quilt I have ever worked on! I have been a professional quilter for almost 20 years and haven’t seen anything this bad. Yes, I am whining and complaining and I could have refused to work on this quilt. The only reason I am working on it (and I have had thoughts of sending it back to the customer only half done) is that if this quilt was being quilted by a new quilter, the new quilter would quit the business! 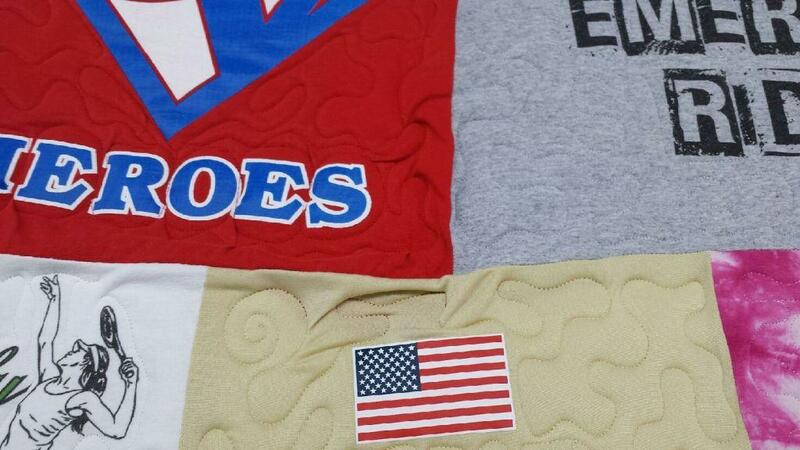 Here are some of the details – it’s a t-shirt quilt that is made with all sorts of t-shirts – cotton, poly, sweatshirts, and anything else that has a stretchy fabric. 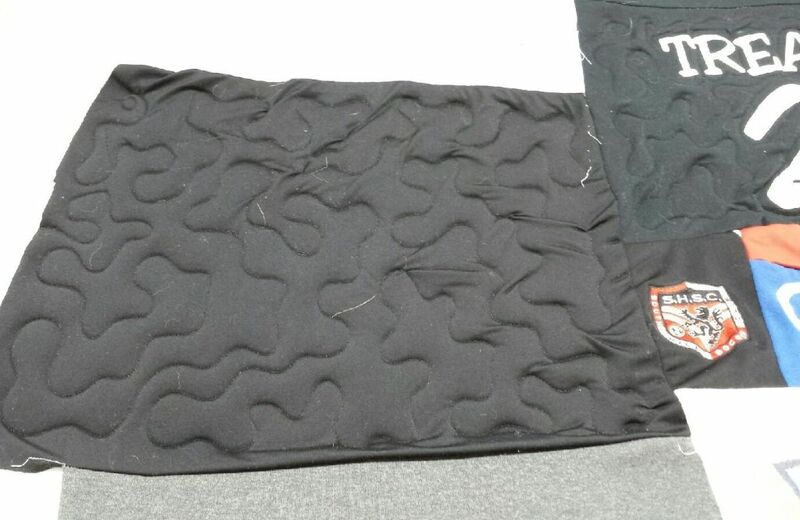 There is NO fusible backing on ANY of the fabrics. The seams are not straight, nothing fits, there are pleats and puckers in the stitching lines. 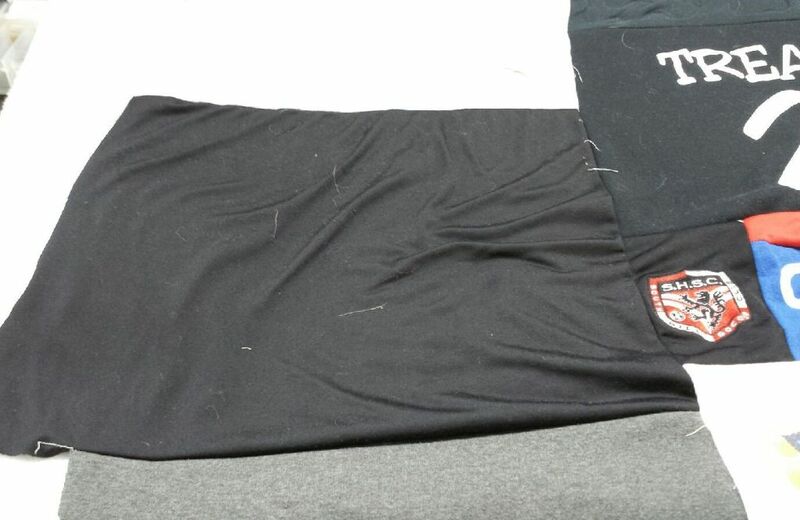 The seam allowances are anywhere from 1/4 inch to 1 + inches and none of the hems of the t-shirts were removed and they are in the seam allowances!!! Here are some photos. Click on the photo for a larger view. Here is the right side border. The red fabric was cut this way. 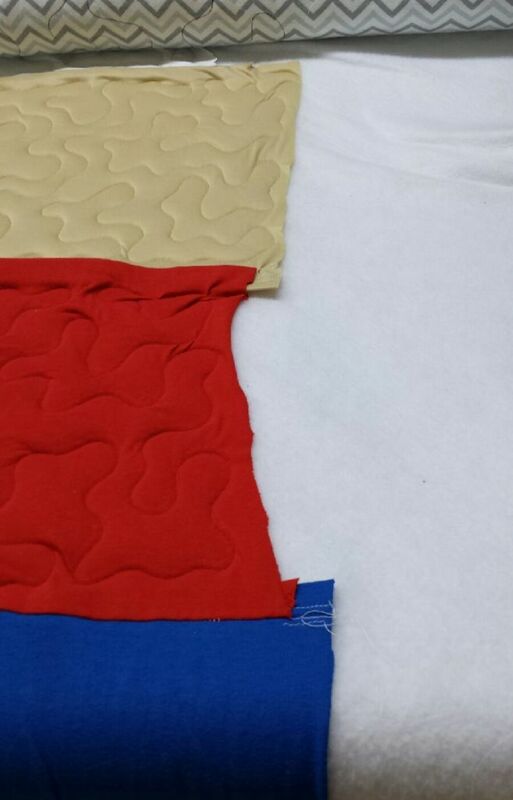 If you look at the seam between the red and blue fabric, the blue fabric has the hem of the t-shirt still attached. Here is another photo – The beige t-shirt is 100% polyester and all the other shirts are heavy cotton or sweatshirt material. If you look close enough (expand the photo) you can see the red fabric seam allowance above the flag graphic. The seam is 1-1/2 inches from the top of the flag. A few more things – the seams are so thick that my machine can barely get over them, and that is just to move the machine back and forth. The seams are so thick that I CAN’T quilt over them. And, of course, this quilt is HUGE at 94 x 110 inches! I also have to trim the quilt to a rectangle and put binding on it. I did talk with my customer and tell her of the issues, documented many of the problems on the worksheet and I’m charging for the work at custom quilting prices. For this quilt, my motto is “I can only do the best I can with what I got!” And I told this to my customer too! Why am I writing all of this – I need some sympathy and someone to tell me I’m doing the best I can. I am also trying hard to make a positive out of a negative. 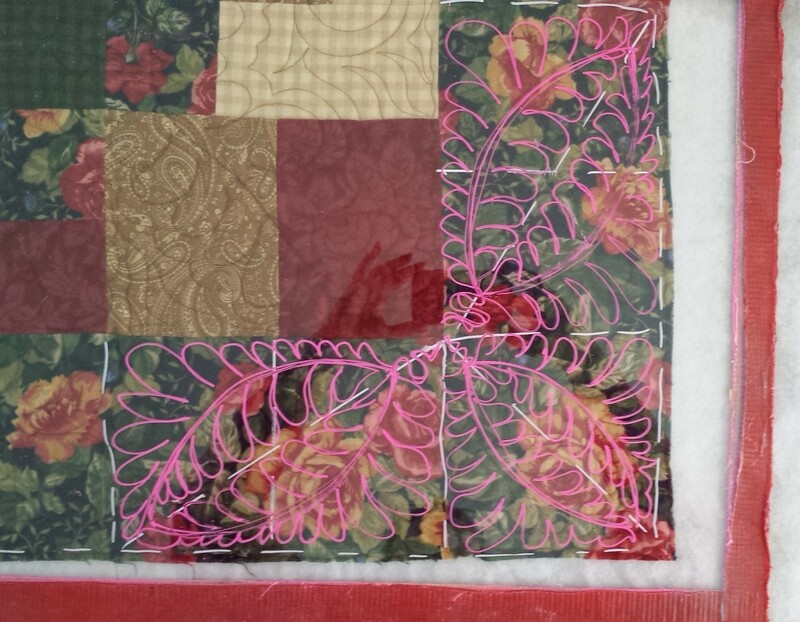 As a quilter – professional or hobbyist – I know that you have had “bad quilts” that you have worked on. If you would like, share your bad quilt experience by either posting about it in the comments section, or send me an email and I will post it for you. Please, no customer names or locations. If you have photos send them too. If anyone can learn from our bad quilt experiences, then the bad quilt will be a good thing. I’ll let you know what happens when my customer picks up the quilt!